What is it that people REALLY want? Often people think that what they want is money, relationship, material possessions, but what they truly want is happiness. One of the key things I do as a coach is to find out what is it they truly want that those things will give. Wealth, health and relationship are just the rewards of being happy. Happiness is a state of vibration that is in harmony with the Universe. As many of us know, the same frequency vibrations tend to attract each other, so the vibration of happiness is going to attract more wealth, better relationship and better health, since these things is going to add more happiness to your life, and they are in the same vibration. If you go after money, you may not get it, if you go after happiness, money will flow to you. The same apply to relationship and health. I believe the ultimate goal in life for many of us is to achieve a state of well being, or we can simply say happiness. Is there an easier way to achieve happiness? The answer is Yes! and here is how. I had learned one phrase from Dr Wayne Dyer, and I would never forget. The phrase is ” How may I serve?”. Dr Dyer said that before his seminars, he will always sit for mediation, and repeat the phrase as a mantra “How may I serve… How may I serve?”. He never bring any notes with him, and when he speaks, the words just keep flowing to him. He knows exactly what to say, and what to teach. 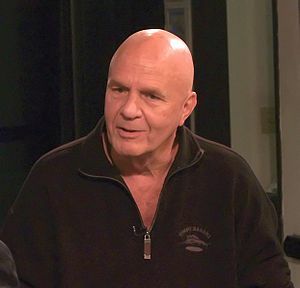 Dr Wayne Dyer is a great role model. He has achieved great success in almost every ear of his life. If the single most important element to Dr Wayne Dyer’s success is this mantra “How may I serve?” then ask yourself now “How may I serve?”. This is the key to ultimate happiness and fulfillment in life. The most enjoyable things I do is writing articles that can makes a difference in the quality of people’s life, to give them inspiration and motivation to create life they would love to have. Whenever I finish writing an article, I feel the positive energy and hope the reader will feel the same. Sometimes the ideas just come, and I put my fingers on the keyboards, then words just starts following. How does this process work, the Law of Attraction principles state that the information does not come from me, it comes from God (or the Higher Intelligence, the Universe), I am only an channel for the information to flow. I am a channel that God has created to serve the world. Because that is what I am here for, so when I am serving, I feel positive energy, and I feel happy. I have learned that my life purpose is to serve, from early days I have been motivated to nuture, empathise, inspire and motivate others. I was a go getter. What is your life purpose? Ask yourself what it is that God (the Universe or whoever your higher being is) wants me to learn, what is it that you are here on earth for. You will only truly feel fulfilled once you realize this truth. Is your life purpose is to serve? I am sure you have heard of that “If you seek happiness for yourself, it will always elude you, if you seek happiness for others, you will find it for yourself.” I know this is why every time I write an article, a book, work with a client I feel so happy, because I know that I am benefiting others and that will change their world to some extent. Maybe 90% of people will not take any action after they read an inspiring article or book, this is nature of human being., but I know as long as they they are absorbing new information, their awareness is expanded, and they will see the difference in the long run. It is less than 10% of people who do actually take actions and it is those peope who are going to change their lives for the better. Starting today find ways to help other people . Find some way to serve. You will get addicted to it, because it is so enjoyable to help. Your help is going to change people’s lives. The person who benefits the most is not the one you give service to, but yourself. You may find it sounds strange, but this is true, and it is governed by the universal law of cause and effect. Anything you cause others to experience will come back to you, and multiplied. If you cause others to experience love, you will find more love in your life; If you cause others to have wealth, you will have more in your own life; if you cause others to succeed, you are guaranteed to succeed. This is the law of the universe, and it never fails. Dr. Joe Vitale of The Secret wonders what amount of money triggers people being uncomfortable. Dr. Joe Vitale of the movie The Secret reveals the secret of life attraction with a three step formula that will help attract anything.